How to set up your AUDIUM speakers? It is important to take care of the position and angles in which you set up your AUDIUM speakers. You can adjust the tone and sound through this. In case of a too strong bass, you can put the foam-plastic plug into the bassreflex tube on the backside of the speaker. This info-leaflet shows in detail how to do this! 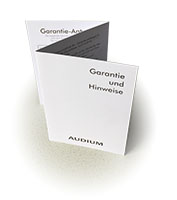 You can extend the product warranty through registering your AUDIUM products. Fill in all data into the warranty card and get your dealer's stamp. Fill out the online-warranty card within 14 days after purchasing the products. Please take care of your sales receipt - in case of a repair, it is required for warranty claims! Wanna know more about the universe...? Dont find the question or answer you are looking for...?